Dec 6, 2017: Today Mr. Trump announced the relocation of the American embassy in Tel Aviv, Israel to Jerusalem just in time to aid in the fulfillment of the Scriptural 70-year prophecy concerning Israel and its Holy City (see Daniel 9:24). It is reported that the embassy relocation and construction will take a few years to complete. 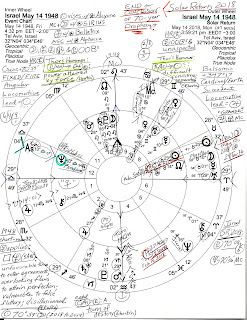 In a previous post, I published the May 14, 1948 4:00 pm EET chart of the State of Israel but today I'm posting the horoscope that Nicholas Campion says many Israeli astrologers use. It is set for 32 minutes later when Ben-Gurion stated that,"The State of Israel has arisen" (independence from Britain). A Locomotive pattern also shows up in the 2018 Return chart but it is lead by Jupiter @17Sco39 Rx. 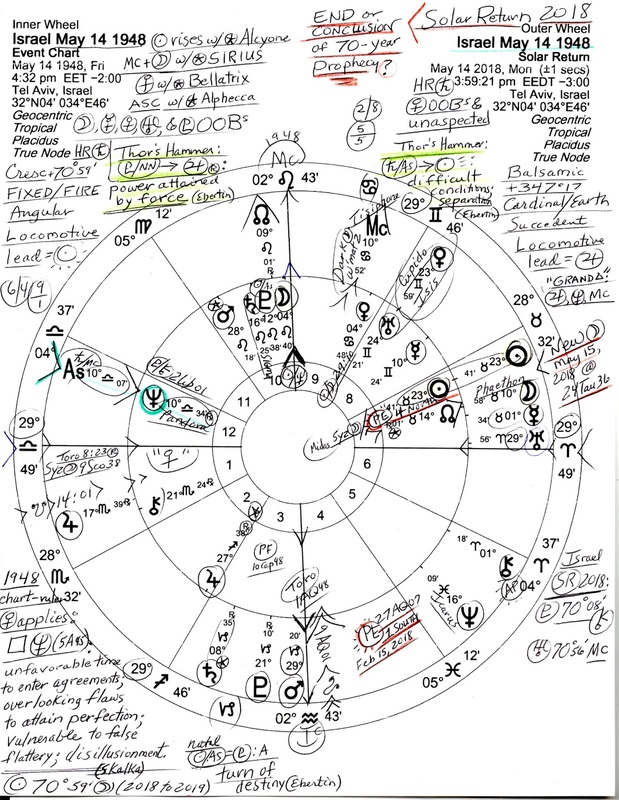 Another planetary pattern that appears in both charts is a Thor's Hammer (aka, Fist of God) which contain elements of fate or karma (reaping what's been sown). In 1948, the Hammer formed between the Pluto-NN square pointing toward natal Jupiter @27Sag38 Rx in 2nd house; in SR 2018, it's between the Saturn-ASC square pointing toward natal/Return Sun in 7th house of Partnerships. We may wish to read the 1948 and 2018 Hammers as midpoint pictures: in 1948 the potential is for 'power attained through force with the help of others' which obviously came true. In 2018, the potential is for 'difficult conditions or circumstances' and/or 'separation' (Ebertin), spotlighting such conditions that have already been in effect for years now particularly for the Palestinian people. Note that a natal or foundation chart for the state of Israel also applies to the same for Palestine). Also note that the August 21, 2017 Total Solar Eclipse 'hit' Israel's 1948 Mars (28Leo18)--and royal star Regulus (keyphrase: success if revenge is avoided). Yet so far, an endless round of revenge tragically characterizes Israel and Palestine since ancient times. As for the timing of the 70-year prophecy related to 2018, note that there will be a New Moon on May 15, 2018 @24Tau36--within orb of Israel's natal Sun and denoting a new cycle of activity. Another curious factor in the SR 2018 chart is that one of the asteroids of fate, Phaethon (the Greek version of Icarus who flew too close to the Sun, crashed, and burned) is snugged between the Taurus Sun and Moon, however, in relation to the 70-year prophecy, Phaethon @11Tau02--about to make its own Return to Israel's natal Phaethon (16Tau23)--may be merely a minor detail. And yet, is it a fated synchronicity that 3-mile wide asteroid Phaethon hurls extremely close to Earth just before Christmas 2017? A certain meteor shower peaks on December 13 with Phaethon traveling among the Geminids. A Super Moon (Nolle) veiled them from sight in 2016 but here are details on where, when, and how to see the 2017 Geminid Meteor Shower. And where is Donald Trump's natal Phaethon, you may wonder. Born June 14, 1946, Mr. Trump's natal Phaethon is @23Tau02 conjunct his natal MC--conjunct Israel's natal Sun! So if you look up and manage to spot Phaethon among the starry throng on December 13 or during the wee hours of December 14, tell him Donald Trump says Hello.